When Greg told his wife Gabriela he got the job transfer to Tucson, they literally danced and sang around their kitchen. “Sunshine! No more horrible winters! No more two-hour commute!” But suddenly they stopped dead in their tracks and stared at each other. “What about the kids’ school!” They were certain they would never find a school in Tucson that offered as much as the school where their boys now attended. Fortunately, when Greg expressed their hesitation at accepting the transfer, his boss was familiar enough with Tucson to be able to recommend Tucson International Academy, a charter school in Tucson he knew would be perfect for them. Greg and Gabriela soon learned that a charter school is an independently-run public school that is granted greater flexibility in its operations. In return for this freedom, the school has greater accountability for performance. The “charter” that TIA adheres to is a performance contract that details their mission, program, students served, performance goals, and methods of assessment. 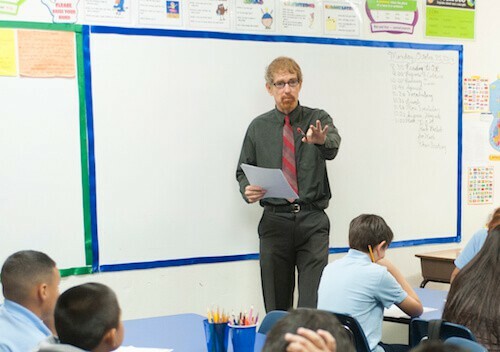 Tucson International Academy, like other charter schools, is a public school of choice, meaning that families choose the school for their children. A charter school operates with freedom from some of the regulations that are imposed upon district schools. TIA is accountable for academic results and for upholding the promises made in their charter. It must demonstrate performance in the areas of academic achievement, financial management, and organizational stability. Tucson International Academy is a team-based learning community that prepares students for a global society. Teamwork, trust, creativity, organization, excellence and community are powerfully held values of Tucson International Academy. TIA offers in depth foreign language programs such as Spanish and Chinese. In addition, TIA offers extensive exploration of, and use of, technology. Academic achievement is highly valued at TIA as is the active and purposeful pursuit of higher education. TIA pursues these goals while also inspiring cultural understanding and community involvement. Every objective at TIA is approached with love, respect and responsibility. After Greg and Gabriela researched Tucson International Academy, their excitement about moving to Tucson not only returned, but was stronger than ever. TIA’s small class sizes, academic excellence, and the superior staff were just what they wanted for their kids. They loved seeing their boys’ eyes light up as together they read that TIA students had just returned from a marine biology trip to Catalina Island, and that a trip to China is being planned for the summer of 2014! This move to Tucson might just be the best thing that ever happened to their family. Does Tucson International Academy sound like the perfect school for your child?